Given that only a small portion of apps are utilized regularly (versus those downloaded), app publishers are faced with the difficulty of creating relationships with users, not just downloads. Take the world of freemium games, for example. Of those consumers downloading their games, only a very small portion actually bring money to the table. In fact, a recent report found that 0.19 percent of all mobile game players contributed 48 percent of revenue. How can one identify the high-spend users while not alienating the remaining percentage that only have potential to spend within the app? 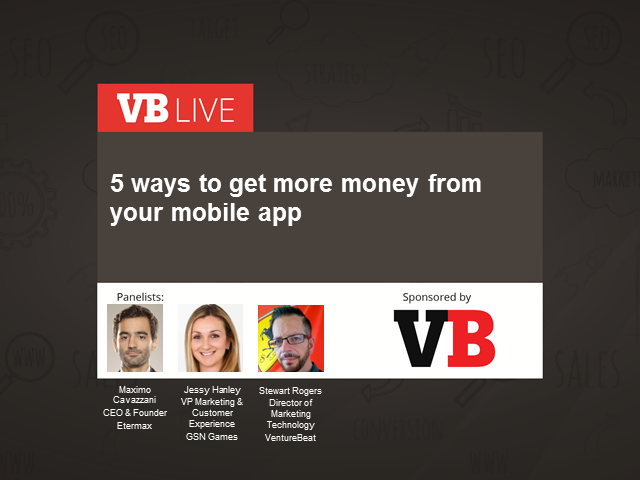 VB'S own Stewart Rogers is going to sit down the CEO of TriviaCrack and talk about how to maximize mobile monetization through these ever-growing mobile touch points for whatever kind of app you have.